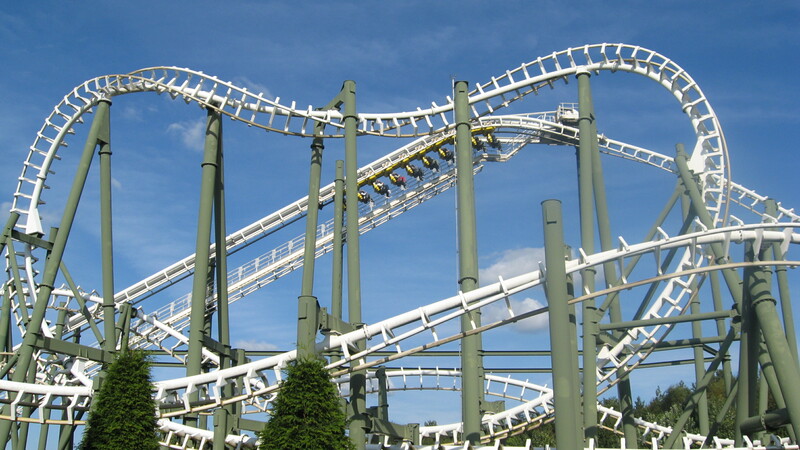 Vekoma launched in 1994 its third best selling product line, the Suspended Looping Coaster (SLC). The Junior Coaster sold 76 rides, the Boomerang 50 and as of 2014, the SLC sold 41 rides around the world. Using the MK-1200 track as a starting point, the SLC feature a small footprint (360 feet x 154 feet) with a 101 feet lift hill for the two “Prototype” layouts. The prototype was the center piece of the reopening Walibi Flevo (Biddinghuizen, Netherlands) in 1994 and was originally supposed to run trains with 10 cars of two passengers. But, after testing, Vekoma brought the number of cars down to 8. The ride opened with 3 16 passenger trains, but today, operates with two. The SLC car is an interesting design, as it basically take their looping train chassis and hang it upside down. Then, from that chassis, a rigid steel pole is mounted on a pivot. The seats are mounted on that hanger, along with the restraints and their locking ratchets. 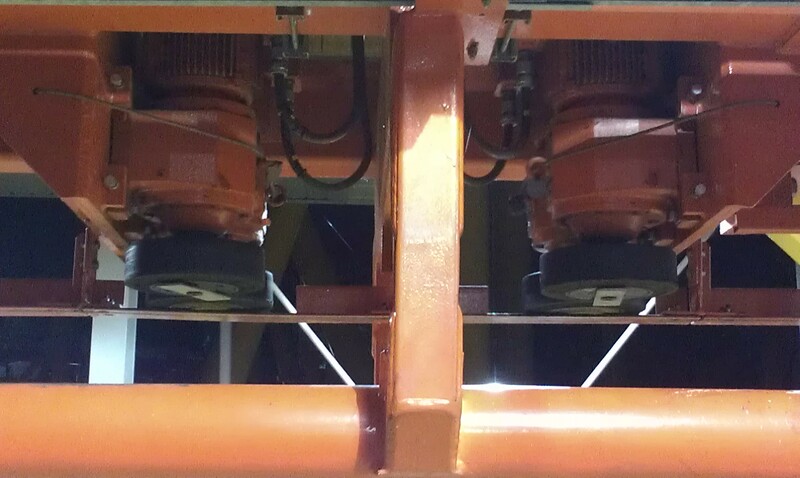 Two hydraulic rams go from the car body to the chassis in a triangle configuration and those rams are there to make sure the car cannot swing to the sides, like on the Swinging Coaster. The lift has a silent anti rollback system, where each car has two spring loaded jaws covered in rubber. When the train goes up, the jaws are open and it is silent. If the lift stop, then the jaws close and will grip a long metal fin that run the length of the lift. It is a very reliable system and it is part of the SOP (Standard Operating Procedure) to have a train stopped on the lift when doing train transfers. 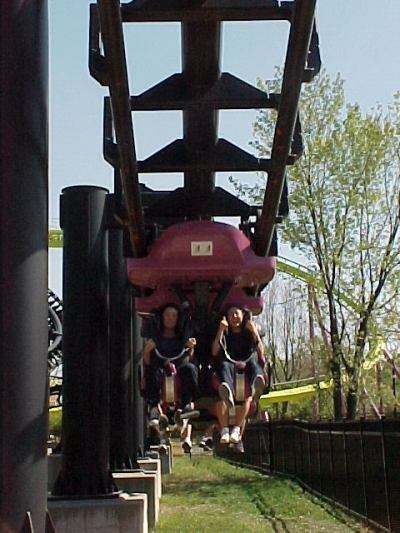 The restraints originally had large hard foam over the shoulder restraints, but after 1995, Vekoma tested new restraints and eventually settled on a molded shoulder bar that prevent riders from lifting their arms and have large soft foam pads near the head. After El Condor opened in 1994 at Walibi Flevo, Vekoma improved the design and worked on a few turns and touched up the finale of the ride. 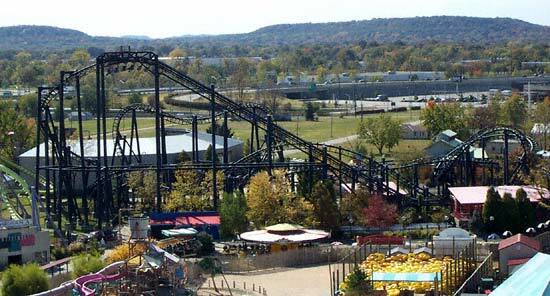 On the 1995 “Standard” layout, which was the one that sold 26 models versus the Prototype model (of which two were built, El Condor and T2 at Kentucky Kingdom in 1995), the first drop was redesigned. It drops faster to the ground and then do a banked turn near the ground leading into the Roll Over (the signature SLC maneuver, it is a half loop, half barrel roll, half barrel roll and half loop succession). On the Prototype, the drop leads directly into the Roll Over. After the Sidewinder, the Standard has a much smoother transition into the double Barrel Roll. The first drop and Rollover on T2. Notice the direct transition into the inversions. The train about to do the bunny hill at the end. The train about to crest the Sidewinder. Pictures appear courtesy of http://www.negative-g.com . The last big difference is that on the Prototype, the train dive under the first drop after the Barrel Rolls. 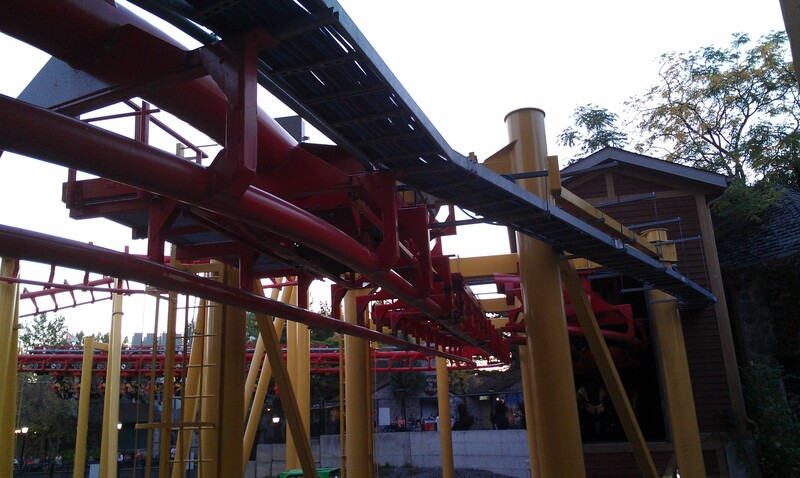 It then rise into a straight airtime hill and then is stopped on the first braking area. On the Standard, the train turns over the first drop and then does an S curve leading into the first braking area. 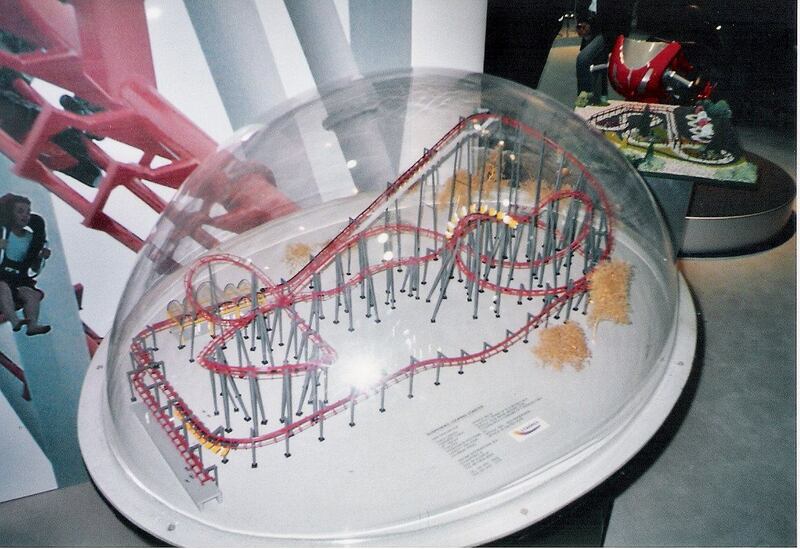 At IAAPA 2003, Vekoma had this model of the Standard SLC on display. In 1995, Vekoma sold in total 9 SLC. 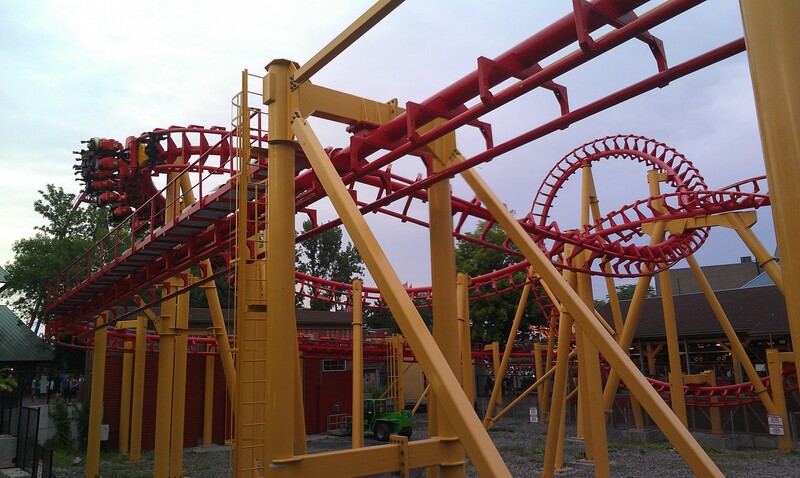 Recent information show that one was the Prototype layout to Kentucky Kingdom (Louisville, KY) as T2 , 5 were Standard and three were customized. The first customized SLC to open was The Great Nor’Easter at Morey’s Pier (Wildwood, NJ). It is the Standard layout, but the supports had to be lengthened and modified in order to fit the very unusual site requirements. The ride is built on top of both a Log Flume and a water park and they need to reach the ground below the boardwalk the park sits on. 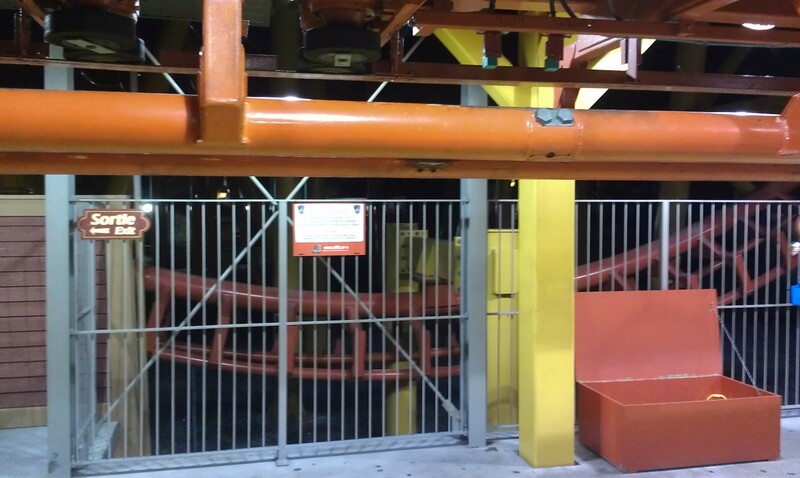 The loading station was also moved to the second braking area and the transfer track flipped to the inside of the ride, whereas on most other installation, it sits on the outside of the second braking area. 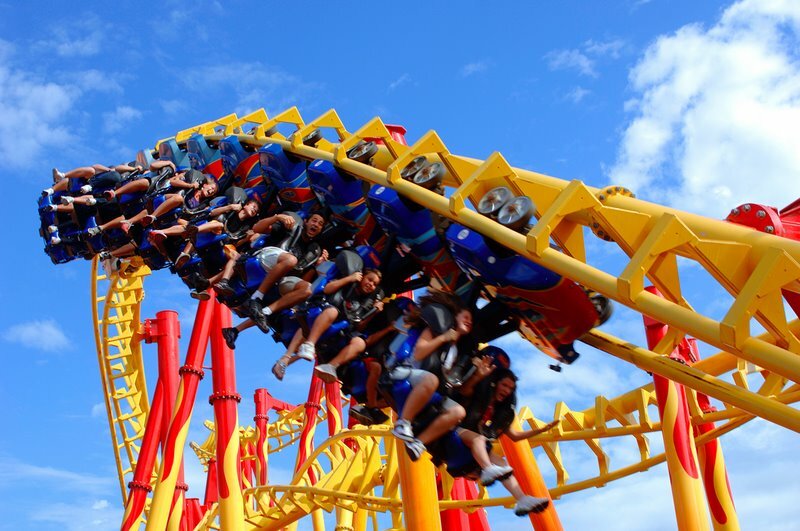 The second Custom ride opened at Warner Bros. Movie World (Gold Coast, Australia) as the Lethal Weapon—The Ride. It is the standard layout and it replaces the ending S curve by an upward helix. The ride still stand and was renamed Arkham Asylum—Shock Therapy in 2012. The third custom was the Blackout at Suzuka Circuit (Suzuka, Japan). 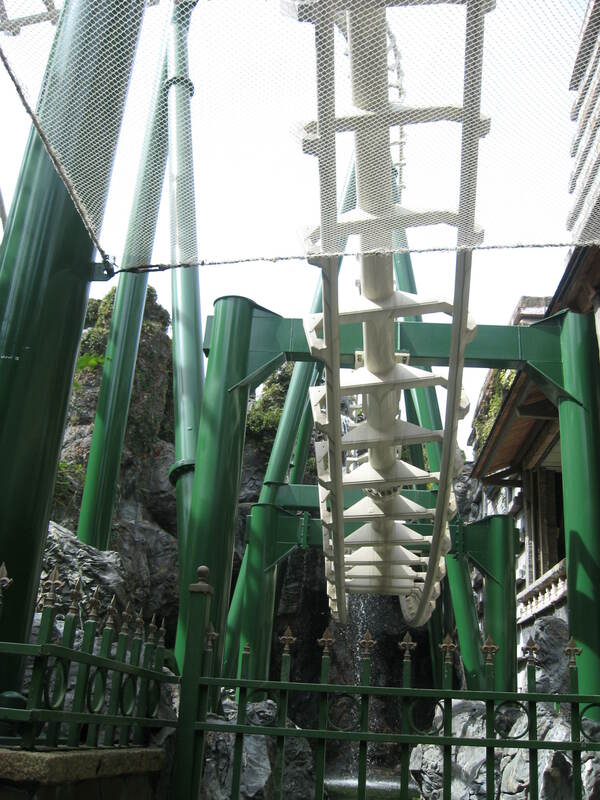 Located near the world famous race track of the same name, the ride was built on the side of a small hill, so the lift supports extend further than on the Standard layout. The transfer track was also modified, to go inside the ride perimeter, like on Nor’Easter. All four SLC sold in Japan were produced in partnership with Meisho Amusement (now known as Sanoyas Leisure) who is a local Japanese partner for many manufacturers. To fit local regulation, they were all produced with full metal floors under the lift hills. Normally, SLC’s have a staircase on the left side and a moving platform slide up and down the lift hill for inspection and guest evacuations. Blackout was sold in 2007 and was moved to South America. 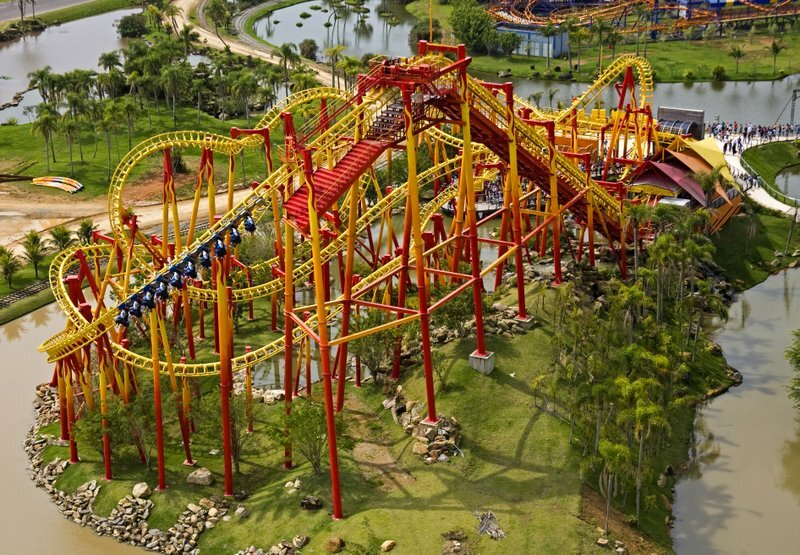 It reopened in 2008 as Firewhip at Beto Carrero World (Penha, Brazil) and got a beautiful new location on its own island. You can see the Japanese evacuation platform extending further down the first drop. 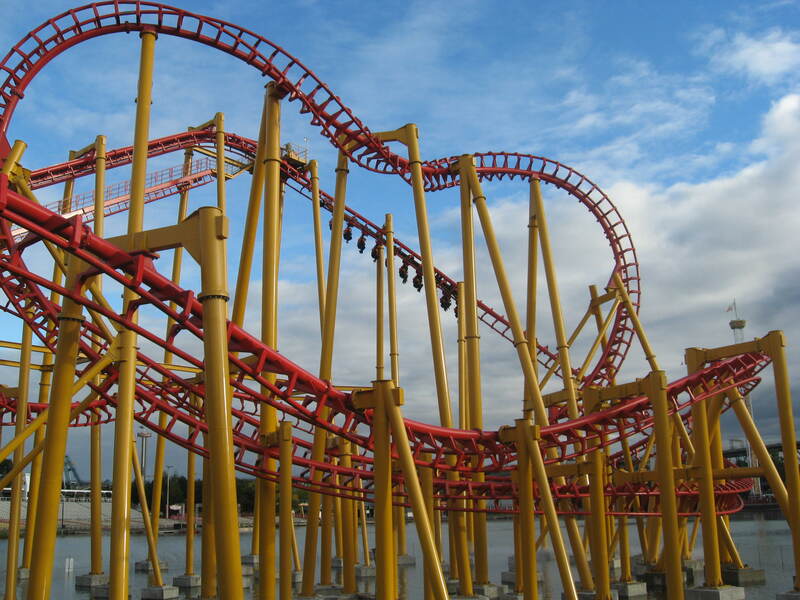 Notice how taller the ride supports are when it goes around the curve at the bottom of the first drop. Firewhip is the only SLC to still have the original restraints. Beto Carrero World added a covering to them and put a U shaped handle bar on them. 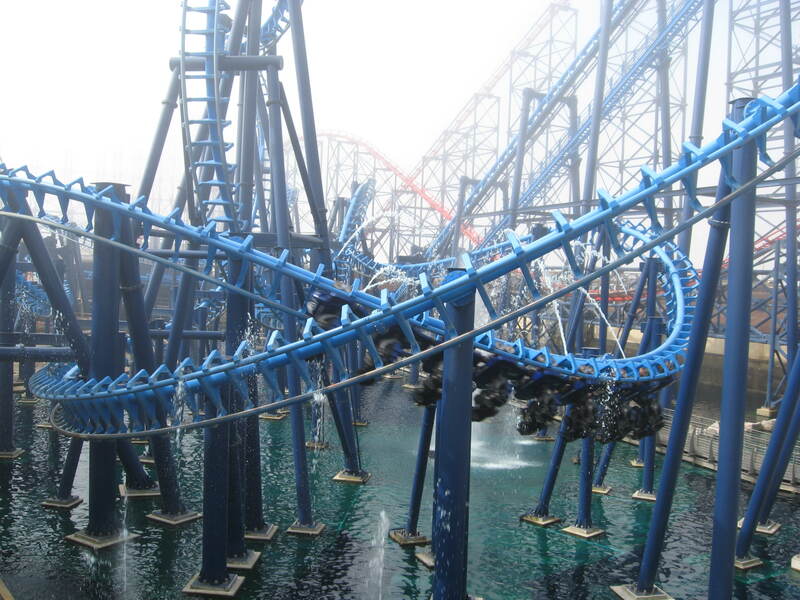 Except for the Traumatizer at Southport Pleasureland (Southport, England) that was moved to the Pleasure Beach, Blackpool (England) in 2007 and Mind Eraser at Six Flags America (Largo, MD), every Standard SLC run trains of 10 cars. T2 at Kentucky Kingdom run short trains of 7 cars and El Condor still run trains of 8 cars. Mind Eraser at Six Flags America got the extra cars in the late 90’s to bring it to 10. 8 cars train going around the last curve on Infusion at Pleasure Beach in Blackpool, UK. Notice the larger transition into the Rollover compared to the Prototype layout. Compare the first drop and Rollover to T2. 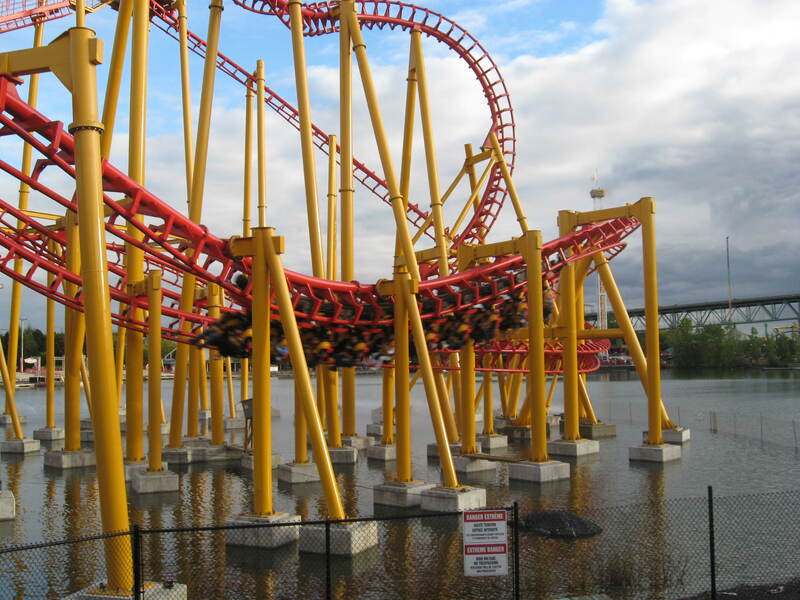 The ride pictured is Ednor-L’attaque at La Ronde (Montreal, QC). 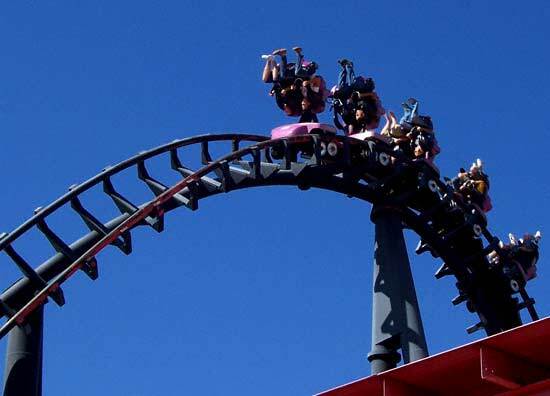 The ride was originally installed at Six Flags Astroworld (Houston, TX) in 1999 and reopened at La Ronde in 2010. Most of the layout is built over the park lake. The train is in the middle of the final S Curve. Ednor’s train going through the 270 degrees helix. The signature Roll Over element on Limit. Limit is a 1999 installation that had the transfer track moved due to site requirements. Heide Park (Soltau, Germany) had the transfer moved behind the station and an extra curve was installed to bring the trains to the service track. It cannot be done during operating hours, as the train go right over the waiting line. 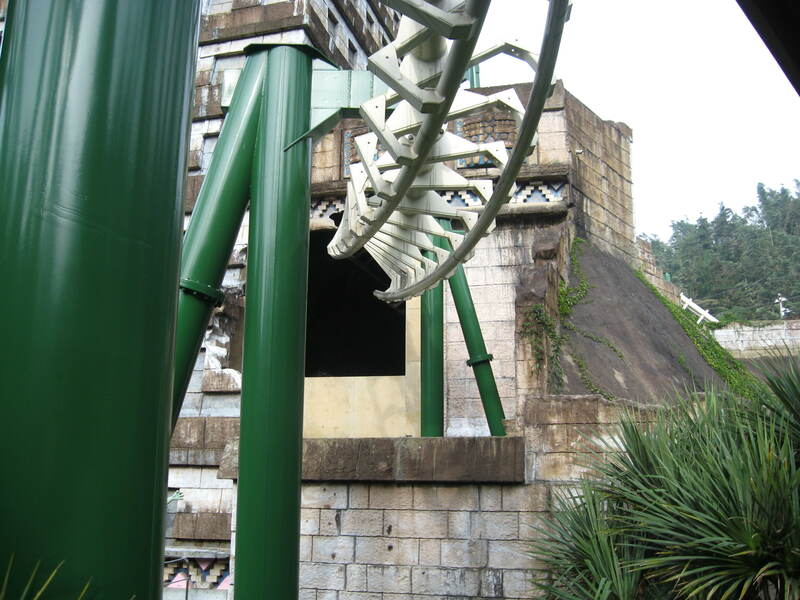 The entrance into the Sidewinder on Mayan Adventure at Formosan Aboriginal Culture Village (Yuchr Shiang, Taiwan). The extraordinary theme on this ride has a waterfall in front of the Sidewinder. So riders get the spectacular illusion of crashing into water before being flipped. The post Sidewinder 3/4 helix is entirely covered and there is a jungle scene inside. View from a walkway that goes through the middle of the ride. On Ednor and on most installations, the Sidewinder entrance is the lowest point of the ride and usually requires a trench to be dug up. This is the post 1996 SLC car. Notice the large restraint with the triangular handle bars and the black foam pads. Those pusher tires drive the train in and out of the station. They grip the braking fin and the metal stip that goes over them is to prevent the car chain dog from touching and damaging them. The standard configuration of the SLC is this one, where the service track sit on the outside of the second braking area. You can see the rotating track switch. 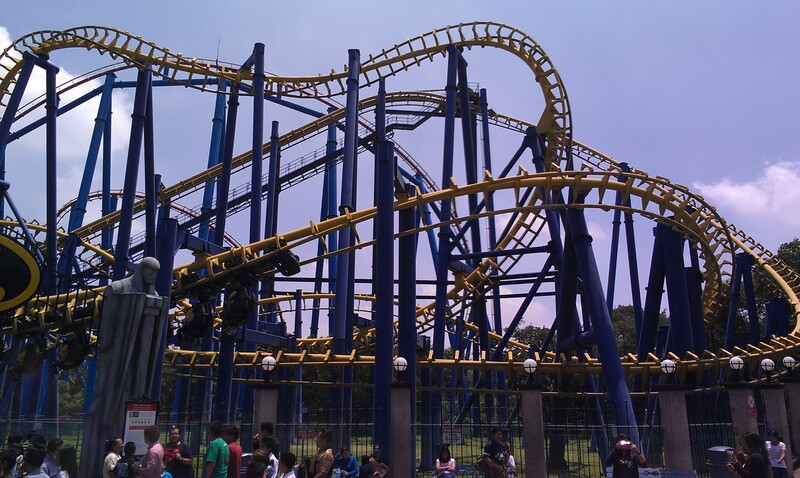 In 1997, Jerudong Park in Brunei installed a custom Suspended Looping Coaster from Vekoma. The fun backstory according to the company that installed this ride in addition to a Vekoma Boomerang is that the rides were gifts to the Sultan’s son and were installed in a park in Brunei. 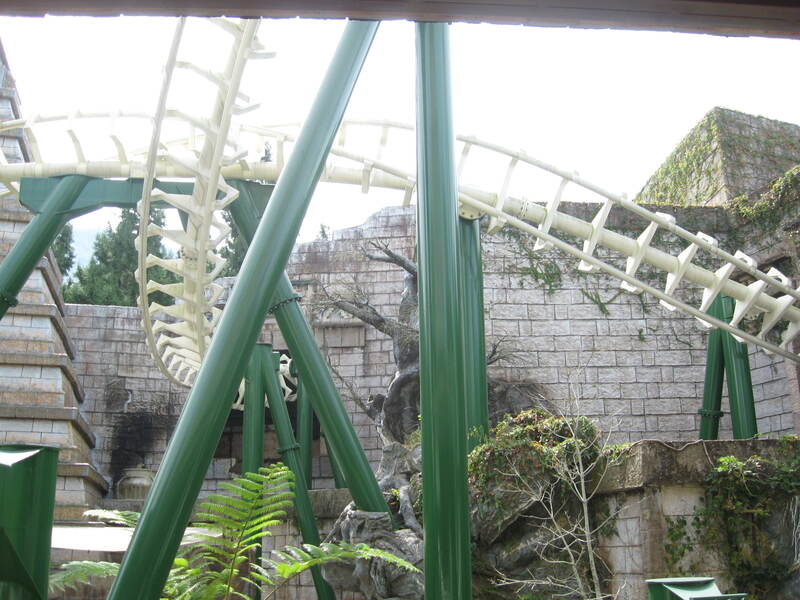 The site requirements were quite unique and Vekoma took the standard elements of the Extended version with Helix, but arranged differently in a wider layout. 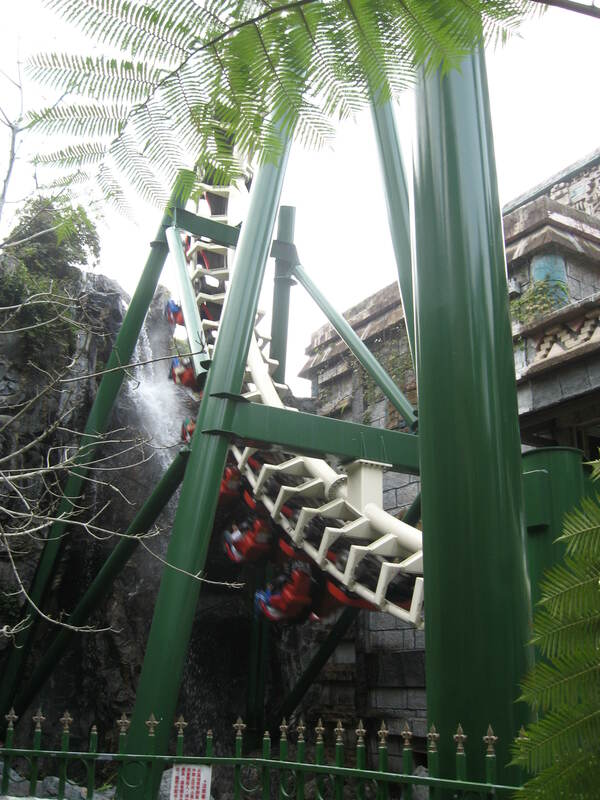 In 2007, Siam Park City in Bangkok installed the Suspended Looping Coaster along with the Boomerang. The Suspended ride was renamed “Vortex” and our friend Flex shot this picture when he visited the park in 2017. 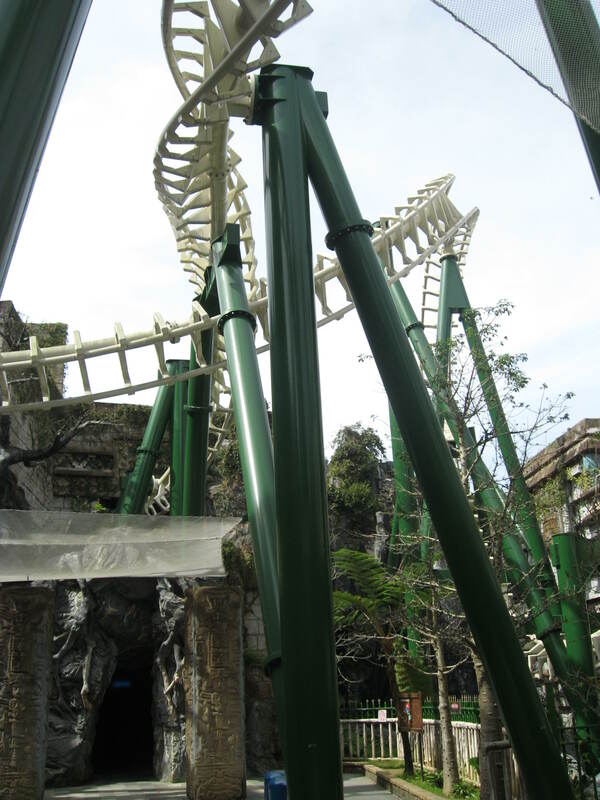 A second ride with the same layout was installed at Suzhou Amusement Park (Suzhou, China) in 2003.
http://www.siamparkcity.com/ sent us this picture of the revised Sidewinder and Helix. 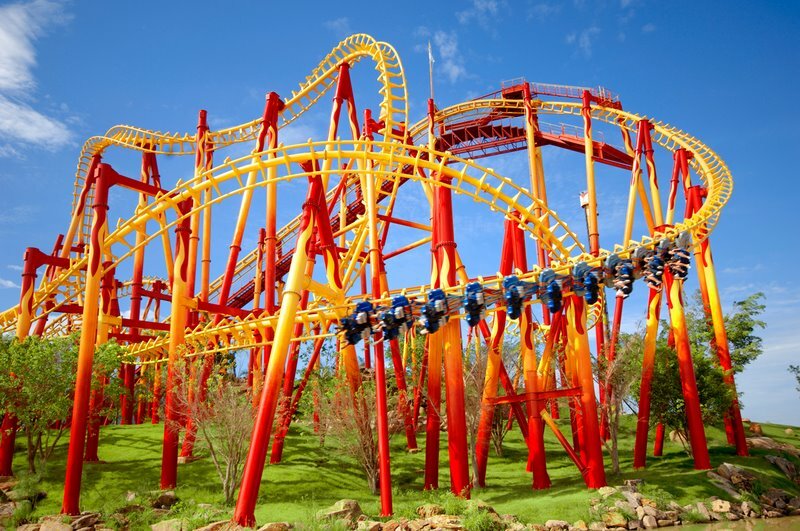 In 2015, Vekoma sold their first SLC’s in 6 years at the new Energylandia amusement park in Zator Poland and at Al-Zawra’s Dream Park in Iraq. Mayan Roller Coaster at Energylandia features the first brand new trains that Vekoma designed in 2008. 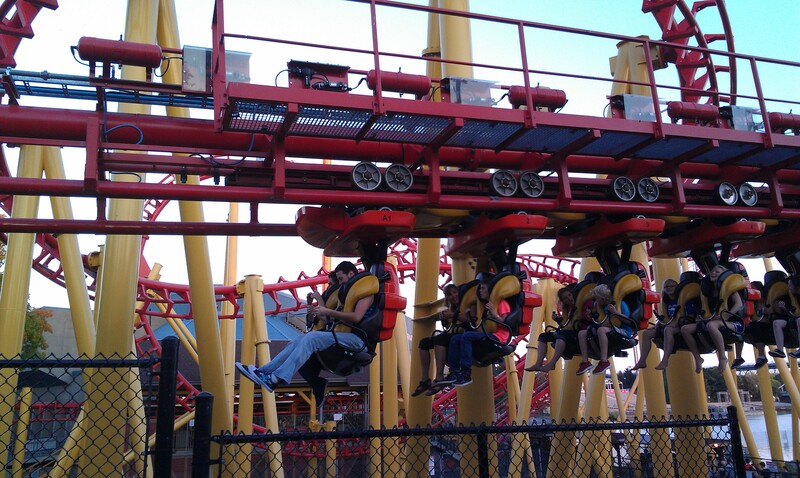 At Morey’s Pier (Wildwood, New Jersey), Isla Magica (Sevilla, Spain), Beto Carrero World (Penha, Brazil) and Six Flags New England (Agawam, MA), the seat assemblies were replaced, but the new hangers were installed on the old chassis. The new Vekoma Suspended Looping with soft vests. 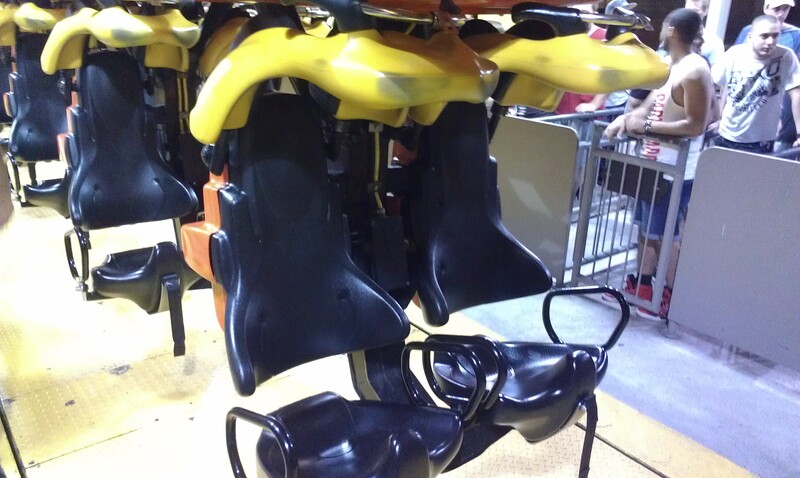 Those are adaptations of the new Suspended Family Coaster seats and restraints with added vests due to the inversions and stronger forces. Flex provided us with this picture of Mayan Roller Coaster. Flex shot this great picture of Mayan Roller Coaster at Energylandia. The station of Mayan Roller Coaster. A look at the far end of Mayan Roller Coaster from Flex. This entry was posted in Coasters, Industry Profile and tagged Batman The Ride, Ednor, Energylandia, Heide Park, La Ronde, Launched Coaster, Mayan Adventure, Mayan Roller Coaster, Mind Eraser, roller coaster, Siam Park City, Six Flags New England, SLC, Suspended Looping Coaster, Vekoma, Vortex. Bookmark the permalink.